I have been hearing a lot about whole grains lately and I have been trying to eat them more often. One of my favorite ways to enjoy whole grains is to use them as the base of a salad. Last weekend I picked up some farro and I had to try using it to make a salad. I had some locally grown asparagus so they were a no brainer and went in. I decided to roast the asparagus to maximize its flavour and since I had the oven on anyways I tossed in some red peppers. I like to use beans in my whole grain salads and I thought that chickpeas would go well in this one. Of course I just had to add some feta. This farro salad turned out really well. I enjoyed the chewy texture of the farro. It was kind of like al dente pasta. I liked this salad so much that I made it again except with quinoa. The quinoa version had a lighter texture and tasted just as good as the farro version. Toss the asparagus in the olive oil, salt and pepper. Roast the asparagus in a preheated 425F/220C oven for about 10 minutes. 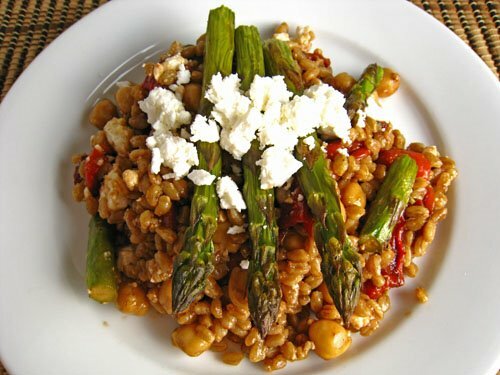 Mix the asparagus, red pepper, farro, chickpeas, and feta in a large bowl. Mix the balsamic vinegar, olive oil, oregano, salt and pepper in a small bowl. Pour the dressing onto the salad and toss to coat. This looks delicious, Kevin. I actually haven’t tried anything with farro myself yet but I’ve been meaning to pick some up. Kevin, with all the experimentation and success with new ingredients, you’re going to turn another room into a pantry! This salad is eye catching, healthy and sounds tasty. I have never heard of ‘farro’ before (I probably just don’t get out enough LOL) Looks interesting. What a creative recipe, sounds like something I’d really like! As usual it looks great. I have never heard of that before..interesting. I bet it would make a great base for a salad. I am sure you could make this with just about any grain – bulgur, brown rice, pot barley, whatever. Many of these types of recipes or pilafs lend themselves to more than one grain as the base. If you are trying to cook with more whole grains, try this recipe. Combine first 4 ingredients in a medium saucepan. Bring to a boil. Cover, reduce heat, and simmer ~30 minutes. Add golden raisins. Cover and simmer ~10 minutes more or until liquid is absorbed. Stir towards the end of cooking so that the grains do not stick to the bottom of the saucepan. If the grains are cooked through and liquid still remains, remove cover, bring to a boil and cook until liquid has dissipated. In a small saucepan, lightly sauté the onion and mushrooms. Add them to the cooked grains along with the green onion, basil and toasted almonds. Whisk together the red wine vinegar, oil, mustard, salt and pepper. Add to the cooked grains and combine well. Taste and adjust for seasonings. This can be served warm and goes very well with pork, chicken or fish. It can also be cooled for a couple of hours and served as a salad. Sounds like a great combination. Interesting because I had the same thought that garbanzos and farro would be a good combination. Looks great! That farro sounds very mysterious. I will have to look out for farro now. Asparagus, on the other hand, it’s all over the green markets. Must try this recipe. I’m trying to use more whole grains, too! This salad has all my favorite flavors in it, now I just have to find some farro or quinoa. Looks great Kevin. I love the asparagus stacked on top. I’ll have to try farro, it looks incredible! I love salads like this during the summer! So filling, yet it does not require an enormous amount of ingredients. Do not know farro at all, but am sure going to look out for it. The salad looks so crunchy and packed with flavor. I know why you later on made this salad again; it just sounds too good! I have a big bag of farro… used to use in soup, either savory or sweet, now very tempted to put in salad as well. Liking the colours in this dish. Real eye appeal! Great combination of flavors you’ve used here! It reminds me of something I made for my mom’s birthday, but I added *loads* more balsamic, haha 🙂 I wanna use my small bag of imported farro already! This is simply perfect. Farro is just perfect here and I love the asparagus. Healthy and yummy! Oh wow, the colors is what really makes this dish pop. It looks interesting and very healthy. Whole grains are always so important in the diet. Wonderful entry Kevin! Thank you. Just the flavors I like. I’ve never had farro . . . I’m adding it to my list of things to try! Looks so tasty Kevin. I love Feta. A really versatile item to keep in your fridge.I haven’t tried whole grains much. I think I’m a little afraid of them. farro – must give this a try soon! can’t believe I still haven’t! it’s looks really hearty. I made my first farro dish today (a salad with corn and tomatoes) and loved it. The idea of combining farro with chickpeas is a good one. This looks great. Hey nice combination of things. Me like! I like farro, i should get it more often. How ironic! I just made an asparagus dish with whole grains the other day…I’m going to have to try the same dish with farro. OK, Kevin – you’ve now got me on the hunt for farro. This salad is right up my alley – yummmm! kevin, you’ve gone and done it again. this salad looks real great and sound very nutritious too. Wow, this looks so good! I need to figure out what the translation for Farro in Spanish is! Looks wonderful! Been trying to get more whole grains myself, and appreciate this recipe! Tx! I’m definitely trying to incorporate more veggies & whole grains into my diet so thanks for the wholesome recipe! Did you serve the farro at room temperature? Ooh, I actually had asparagus for the first time yesterday! Must be fate ^__^. Looks great. redforever: Thanks for the recipe. It sounds good. I am going to have to try combining more than one whole grain in a dish. Sharon: I had the salad warm the first time and I ate the leftovers cool from the fridge. It was really good both ways. Hi Kevin is there no end to your talents? You now give us a most fablous farro salad with roasted asparagus & peppers – just truly wonderful!! What a delicious and hearty salad! Looks awesome and makes me sad that my asparagus is done producing for the year. I need to branch out and try more whole grains. That sounds incredible, what wonderful flavor combinations. I would eat this any day! 1 cup farro (measured dry) before cooking (which will give me 2 cups cooked)?? Or 1 cup already cooked farro?